Nitric oxide (NO), a gas with many biological functions in healthy cells, has also been implicated in the development of pathologies such as cancer. Nitric oxide may also play a role in chemotherapeutic reisitance. For example it had been known (in the 1996 Melanoma study by Joshi et al. curated below) that nitric oxide synthase activity (the enzyme system which produces NO) was significantly elevated in cultured melanoma cell lines versus normal melanocytes. Although it is known that many protein and enzymes systems could be directly covalently-modified by nitric oxide, either by S-nitrosylation or NO-NAD+ modifications (one of my earlier postings described one such protein modified by nitric oxide, GAPDH, and the effect these NO-modifications of GAPDH has on the etiology of various pathologies. ), the molecular mechanisms by which these modifications affect cellular processes, lead to disease etiology, the proteins which are affected, and mechanisms related to chemotherapeutic sensitivity need to be further characterized. A new study from MIT reveals how NO-induced modifications may reduce cisplatin sensitivity in melanoma cells. This study focuses on how decreasing nitric oxide levels in melanoma cells increases their cisplatin sensitivity. The study also describes a possible mechanism for this effect: NO-induced modifications of the proapoptotic enzyme caspace-3 and prolyl-hdroxylase-2 (responsible for targeting prosurvival HIF-1α for proteosomal degradation). Also, for a description of other cancer-related targets of nitric oxide please see the posting by Dr. Saxena at Crucial role of Nitric Oxide in Cancer on this site. It is important, however, to note that most of these relationships between NO-induced protein modification and its relationship to disease mechanisms are causal, meaning that, in general, one notices a nitric-induced modification of a protein/enzyme with concomitant alteration of protein/enzyme function occurring in a disease/phenotype. However, unlike reversible modifications, which have a cadre of pharmacologic inhibitors, nitric oxide induced modifications are covalent and nonenzymatic, therefore hindering easy cause/effect relationships. With that said, the following was adapted from the MIT site at http://web.mit.edu/newsoffice/2013/how-melanoma-evades-chemotherapy-0407.html. The findings from Dr. Luiz Godoy’s PNAS paper ENDOGENOUSLY PRODUCED NITRIC OXIDE MITIGATES SENSITIVITY OF MELANOMA CELLS TO CISPLATIN, were presented at the 2013 annual meeting of the American Association for Cancer Research. The prognosis is generally worse for patients whose tumors have high levels of NO, said Luiz Godoy, an MIT research associate and lead author of the study. Godoy and his colleagues have unraveled the mechanism behind melanoma’s resistance to cisplatin, a commonly used chemotherapy drug, and, in ongoing studies, have found that cisplatin treatment also increases NO levels in breast and colon cancers. “This could be a mechanism that is widely shared in different cancers, and if you use the drugs that are already used to treat cancer, along with other drugs that could scavenge or decrease the production of NO, you may have a synergistic effect,” said Godoy, who works in the lab of Gerald Wogan, an MIT professor emeritus of biological engineering and senior author of the study. NO has many roles within living cells. At low concentrations, it helps regulate processes such as cell death and muscle contraction. NO, which is a free radical, is also important for immune-system function. Immune cells, such as macrophages, produce large amounts of NO during infection, helping to kill invading microbes by damaging their DNA or other cell components. 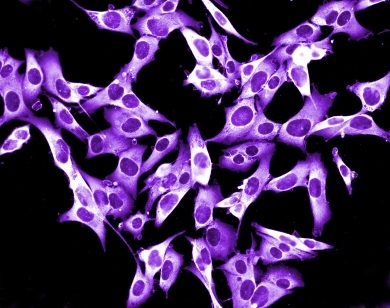 In the new study, the researchers treated melanoma cells grown in the lab with drugs that capture NO before it can act. They then treated the cells with cisplatin and tracked cell-death rates. The NO-depleted cells became much more sensitive to the drug, confirming earlier findings. The MIT team then went a step further, investigating how NO confers its survival benefits. It was already known that NO can alter protein function through a process known as S-nitrosation, which involves attaching NO to the target protein. S-nitrosation can affect many proteins, but in this study the researchers focused on two that are strongly linked with cell death and survival, known as caspase-3 and PHD2. The role of caspase-3 is to stimulate cell suicide, under the appropriate conditions, but adding NO to the protein deactivates it. This prevents the cell from dying even when treated with cisplatin, a drug that produces massive DNA damage. PHD2 is also involved in cell death; its role is to help break down another protein called HIF-1 alpha, which is a pro-survival protein. When NO inactivates PHD2, HIF-1 alpha stays intact and keeps the cell alive. The MIT researchers also found in some cancer cells, NO levels were five times higher than normal following cisplatin treatment. Godoy is now investigating how cisplatin stimulates that NO boost, and is also looking for other proteins that NO may be targeting. Nitric oxide synthase activity is up-regulated in melanoma cell lines: a potential mechanism for metastases formation. Joshi M, Strandhoy J, White WL. Department of Dermatology, Bowman Gray School of Medicine, Wake Forest University, Winston-Salem, NC 27157, USA. Nitric oxide (NO) may be an important mediator of tumour angiogenesis and metastasis formation. Tumour cell derived NO may be important in the regulation of angiogenesis and vasodilatation of the blood vessels surrounding a tumour. The aims of the present study were, firstly, to determine whether malignant melanoma cells and normal melanocytes had nitric oxide synthase (NOS) activity (measured by the conversion of L-arginine to L-citrulline) and, secondly, to determine whether there was a difference in NOS activity between malignant and normal cell types. This paper assays NOS activity directly in lysates from normal human melanocyte and malignant melanoma cell lines. The enzyme activity was not inducible with bacterial lipopolysaccharide and could be heat denatured. The activity of NOS was demonstrated to be both NADPH- and calcium-dependent and it was inhibitable in a dose-dependent manner by the NOS inhibitor Nw-nitro-L-arginine methyl ester. We conclude that melanoma and melanocyte cells express a constitutive form of NOS. Finally, nitric oxide synthase activity in melanoma cell lines was found to be significantly greater than in normal melanocytes. These findings suggest that NO synthesis is elevated in malignant melanoma. An elevated NO concentration in melanoma is expected to promote metastases by maintaining a vasodilator tone in the blood vessels in and around the melanoma. Proc Natl Acad Sci U S A. 2012 Dec 11;109(50):20373-8. doi: 10.1073/pnas.1218938109. Epub 2012 Nov 26. Endogenously produced nitric oxide mitigates sensitivity of melanoma cells to cisplatin. Godoy LC, Anderson CT, Chowdhury R, Trudel LJ, Wogan GN. Melanoma patients experience inferior survival after biochemotherapy when their tumors contain numerous cells expressing the inducible isoform of NO synthase (iNOS) and elevated levels of nitrotyrosine, a product derived from NO. Although several lines of evidence suggest that NO promotes tumor growth and increases resistance to chemotherapy, it is unclear how it shapes these outcomes. Here we demonstrate that modulation of NO-mediated S-nitrosation of cellular proteins is strongly associated with the pattern of response to the anticancer agent cisplatin in human melanoma cells in vitro. Cells were shown to express iNOS constitutively, and to generate sustained nanomolar levels of NO intracellularly. Inhibition of NO synthesis or scavenging of NO enhanced cisplatin-induced apoptotic cell death. Additionally, pharmacologic agents disrupting S-nitrosation markedly increased cisplatin toxicity, whereas treatments favoring stabilization of S-nitrosothiols (SNOs) decreased its cytotoxic potency. Activity of the proapoptotic enzyme caspase-3 was higher in cells treated with a combination of cisplatin and chemicals that decreased NO/SNOs, whereas lower activity resulted from cisplatin combined with stabilization of SNOs. Constitutive protein S-nitrosation in cells was detected by analysis with biotin switch and reduction/chemiluminescence techniques. Moreover, intracellular NO concentration increased significantly in cells that survived cisplatin treatment, resulting in augmented S-nitrosation of caspase-3 and prolyl-hydroxylase-2, the enzyme responsible for targeting the prosurvival transcription factor hypoxia-inducible factor-1α for proteasomal degradation. Because activities of these enzymes are inhibited by S-nitrosation, our data thus indicate that modulation of intrinsic intracellular NO levels substantially affects cisplatin toxicity in melanoma cells. The underlying mechanisms may thus represent potential targets for adjuvant strategies to improve the efficacy of chemotherapy.